For those who are interested in getting off the beaten path and diving deeper into what the Twin Cities has to offer, the St. Paul bus route has something for everyone. From challenging, boundary-pushing work in sparkling galleries to hip lofts and homey workspaces, St. Paul’s clay scene does not disappoint. The city is home to one of the largest concentrations of Colleges and Universities in the world, yielding an academy-driven town that is thoughtful, cool, and steeped in history. Three St. Paul colleges and universities have rallied for NCECA, including Concordia University – home institution of former NCECA president Keith Williams, the progressive, prestigious and artsy Macalester College, and the all-women’s St. Catherine’s University. The St. Paul bus route features some of the newest art spaces in town. Including The Minnesota Museum of Art (aka “The M”) – that re-opened in December after a long but successful renovation process. Creator’s Space – a stunning new multi-purpose art utopia on the hip and fast-growing West 7th street is a must-see. “The world is in a period of reawakening and change,” write founders Melissa and Kevin Dessart, “we believe it’s time to ignite a creator’s movement. Artists, entrepreneurs, and philosophers deserve a space, the tools, and an encouraging environment to think, explore, and ultimately create.” Creator’s Space is host to two Montana-based residency shows. The Archie Bray Foundation 2018 residency show will be a notable stop. With five clay shows on campus there is plenty to see at St. Kate’s. Highlights include, Accumulation, a two-woman show featuring impressive installation work by Judy Onofrio and ceramics faculty Monica Rudquist. The neutral palate and clustered assemblage of repeated forms and textures tie the work of these two artists together. For architecture buffs, a self-guided tour of St. Kate’s historic chapel offers a look at the largest commission in existence by tile maker Ernest Batchelder, leader in the American Arts & Crafts movement. Co-curated by Ceramics Professor Summer Hills-Bonczyk and Jehra Patrick, Strange Place is a polished, multi-sensual and poetic show that presents clay in a variety of unconventional and non-traditional ways including video, performance and installation. Be sure to grab a catalog as there are several beautiful literary contributions that tie in themes of magical realism, land and place. Strange Place may be one of the most international shows in town with artists from India, Singapore, Switzerland and the US. During the conference artist Jason Lim will be on site presenting a performance and installation utilizing 3500 pounds of wet clay. On West 7th street, you can’t throw a rock without hitting a microbrewery and it’s just a short walk from the Mississippi river. A favorite stop on the St. Paul art crawl, the Schmidt Artist Lofts might just make you want to move to St. Paul. Brad Menninga’s “Wedgewood fakes” at the Pig’s Eye Gallery are worth checking out. If you navigate to Schmidt on your own, be sure to stop for lunch at Keg and Case, recently voted the #1 food hall in the country by USA Today. This food and craft marketplace has a quintessential Twin Cities vibe; cool, clean and vaguely Scandinavian. The Landmark Center is, perhaps, one of the most beautiful buildings in town, maintained by the City of St. Paul and site of regular cultural events and active organizations. You will be awed by the gorgeous lobby alone. 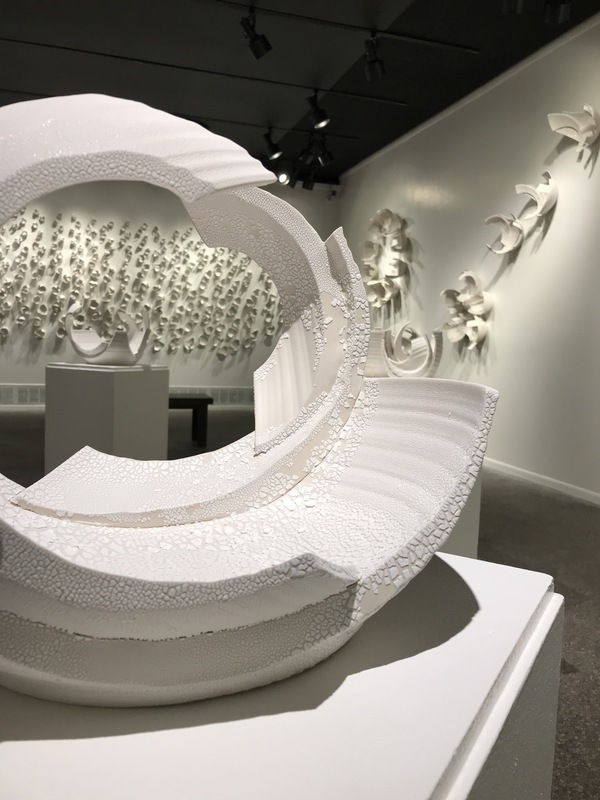 Don’t miss the American Association of Wood Turners Gallery of Wood Art a space dedicated to clay’s sister medium and Ray Chen: Ceramic Sculptor at the North Gallery. Tickets are still available for this fabulous tour, click here for details on this and other bus opportunities!